3:10 to Yuma appears in an aspect ratio of approximately 1.85:1; the image has been enhanced for 16X9 televisions. Though not flawless, given the film’s age and the limitations of SD-DVD, I thought it looked quite good. Sharpness tended to be fine. Wider shots could seem mildly soft, but those sequences caused only minor distractions. Overall clarity seemed nice. I saw no signs of jagged edges or shimmering, while edge haloes appeared to be modest. Print flaws were also insignificant. I noticed a few small specks but nothing more than that. Blacks came across as deep and rich, while shadows seemed positive. I felt consistently pleased with this presentation. While not quite as impressive, the film’s monaural audio was perfectly fine for its age. Speech worked well enough. The dialogue lacked notable edginess and remained intelligible and relatively warm along the way. Music appeared reasonably full, and effects fared the same way. Louder elements were fairly clear and the whole shebang delivered a good sense of accuracy. Nothing here dazzled, but the audio was more than satisfactory. 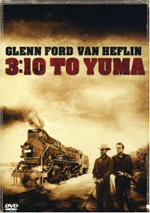 The disc includes trailers for Yuma, its 2007 remake, and various “Classic Westerns”. No other bonus features appear here. The absence of supplements becomes the only disappointment here. As a film, 3:10 to Yuma provides a rich, involving drama with nary a misstep in display. In particular, its lead actors delight with full-bodied performances. The DVD delivers good picture and audio, but we find virtually no extras. I like the movie enough to recommend it, but I’d feel more enthusiastic if it received the special edition treatment it deserves.